Built between 1814 and 1817 for William Wyndham, this stately house (now known as Philipps House) has been owned by The National Trust since 1943. 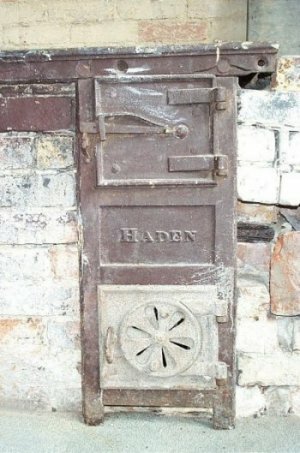 In the Kitchen can be seen the remains of the original combined solid fuel cooking stove and baking oven of Haden manufacture. (note the HADEN name on the stove front plate). Jeffry Wyatt (later Sir Jeffry Wyattville) one of the up and coming architects of that time was invited by William Wyndham to design for him a new house. The intriguing question is how and why did he choose the firm of G & J Haden to manufacture and install the Kitchen stove and oven. 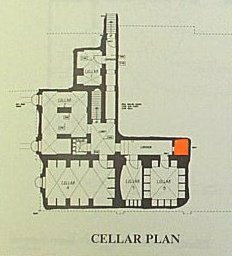 Did he ask his architect family or friends to recommend a suitable local firm and were Hadens then employed based upon this recommendation? 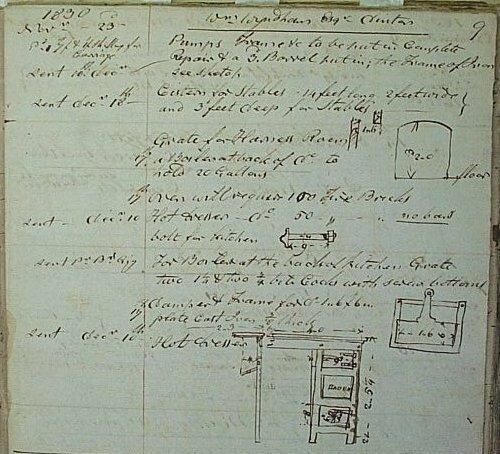 Research carried out at the Wiltshire Records Office (WRO) discovered the Haden order book entry for this Kitchen stove was made on November 23rd 1830. The main house was completed in 1816 and possibly occupied in 1818, with these alterations to the house's cooking equipment taking place 12 years later. This must have become necessary to bring the house’s cooking facilities up to date and in keeping with the latest improvements that were becoming available. Cistern for stables 14 feet long 2 feet wide and 3 feet deep for stables. Of the first six warm air stoves recorded in the Haden order books, stoves Nos. 2-6 were installed by James Haden at nearby Wilton House for the Earl of Pembroke only 5 miles away from Dinton. Did word about the quality of work that James Haden carried out at Wilton House get passed on to other members of the Aristocracy and Landed Gentry in the Wiltshire area? Was this why Jeffry Wyattville the Architect gave the Dinton House order to G & J Haden? 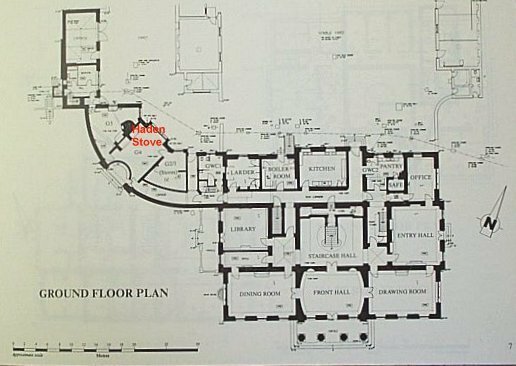 Other records at the WRO show that in 1826 G & J Haden installed warm air stoves in the King’s private apartments at Windsor Castle. These stoves formed part of the major restoration works that Jeffry Wyattville carried out for George IV at Windsor Castle between the years 1824 and 1840. The fact that there existed a working relationship between the architect Jeffry Wyattville and the firm of G & J Haden is beyond doubt. This must have enabled him to recommend the Haden brothers as competent heating engineers to royalty and his other clients? How this working relationship started and what buildings were involved will need further research. To find the answers to these questions would be most revealing. 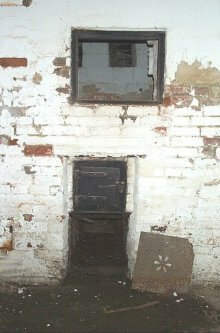 In the basement of the house the original cockle type warm air stove c1830 built into a brickwork furnace still remains although long ago abandoned. 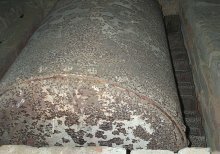 It is of riveted construction with a semi-circular top built over the cockle. 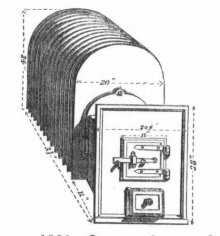 Both vertical sides of the stove are fitted with a number of vertical projecting fins which provided additional heating surface. This stove is not known to be of any Haden design but is similar in shape to the type manufactured and supplied by William Sylvester during that same time period. The heating and ventilating system distributed warmed air through ducts built into the structure of the building. 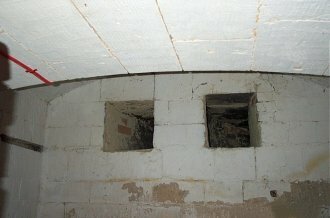 These ducts from the furnace chamber are routed at high level in the basement and supplied heating and ventilation to the Ground floor rooms through gratings sited in both walls and floors. 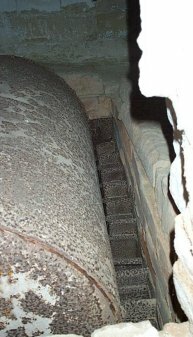 It is interesting to see in the furnace chamber above the stove that even in those early days when passive ventilation systems had just started to be installed, that the builders work ducts had radiused corners to minimise frictional air losses. The approx. 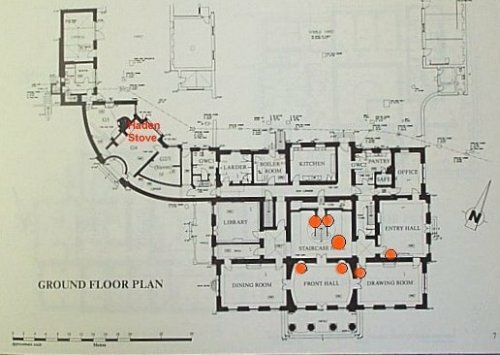 positions of the 7 gratings and grilles in the Ground floor rooms are shown as red circles on the floor plan below. 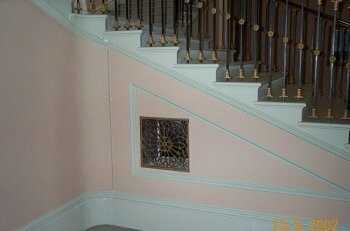 The ventilation gratings fitted in the sides of the main staircase and also in the floor were provided to allow the warmed air to rise which also helped to provide some heat to the first floor rooms. In the Drawing Room and Front Hall, low level bronze ventilation grilles with adjustable dampers are fitted at skirting level. 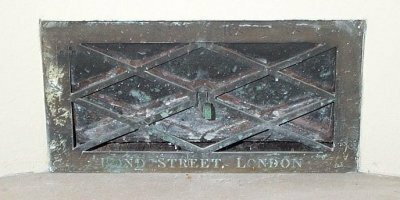 These grilles are stamped with the inscription “Bond Street London”.